If your kids have boring one color sweater they don't want to wear adding some fun applique may be the solution. 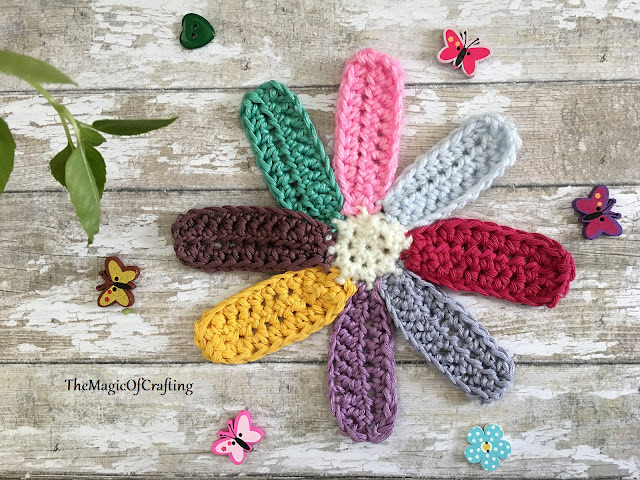 This flower is so easy that even a beginner in crocheting should be able to do it in a matter of just minutes. This is also the perfect project for using the small amount of yarn left. Yarn: Whatever you choose, this is made with scraps. Finished size: 6.5 in/16.5 cm from the top of one of the petals to the top of the opposite one. Start with magic circle and 8 hdc into it. Ch 1, hdc in the same st, 2 hdc in each of the rest 7 st. End with ss in ch 1. Join different color and ch 11, hdc in the second st from hook, hdc in the next 9 st (10 hdc made), ss in the same st where the chain started. Turn. Hdc in the same st, hdc in the next 9 st of the petal. Turn. Hdc (no chain to make round petal) in same st, 1 hdc in each of the 9 st, ss in the next st of the white circle. One petal made. Insert the hook into the next st of the circle, join another color and pull through with the new color. With the new color repeat the petal pattern. Make 8 petals.